There is a real possibility that some search warrants shown by police officers during drug raids are not legally binding. On Wednesday, February 1, 2017, a case in which Bequia resident Ken Michael was charged with having 63 grams of cannabis was withdrawn at the Serious Offences Court when Michaelâs lawyer pointed out that the search warrant shown to the court was not properly signed. Michael was arrested on February 8, 2016 when Rapid Response Unit (RRU) officer PC 403 Nigel John headed a party of RRU officers to his home to execute a search warrant in respect of control drugs. During the court proceedings, Michaelâs lawyer Grant Connell asked to see the search warrant and after examining the document, Connell objected to having it admitted into evidence. Connell asserted that the search warrant was concocted, as there was no date where the Justice of Peace (JP) is required to give their signature to show when it was created. âI know these things must surface!â he exclaimed. 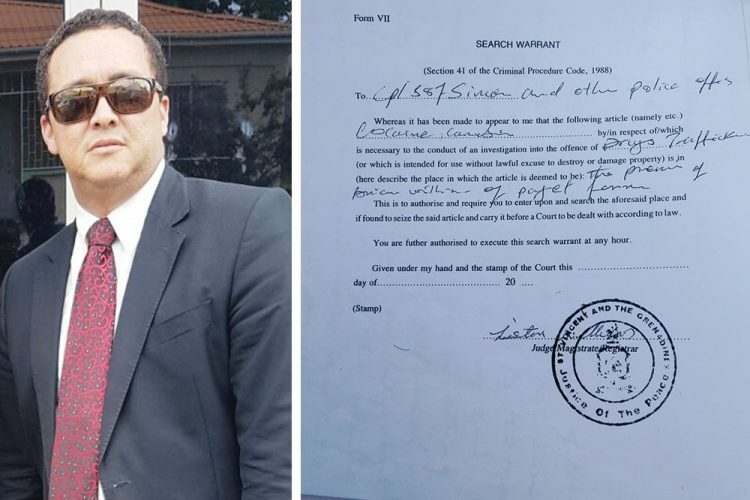 Connellâs objection saw resistance from Chief Magistrate Rechanne Browne-Matthias and prosecutor Elgin Richards, who once again asked that the search warrant be admitted into evidence. A few moments after, Richards rose and told the Chief Magistrate that the Crown would be withdrawing the charges against Michael. When SEARCHLIGHT requested to see the document after the court proceedings, Richards declined, stating that it would be unethical of him. In an interview moments after, Connell told SEARCHLIGHT that he was instructed that his client was never shown a search warrant, adding that a JP should be more than a rubber stamp authorizing a document, which he says is an extremely powerful one. A legal dictionary defines âjust causeâ as a reasonable and lawful ground for action. âItâs very frightening; the case is a real eye-opener to many things; to think that all this legal gymnastics with the prosecution is over 63 grams of marijuana that they said a young man was met in his house with?â said Connell. The outspoken lawyer said he trusts the Commissioner of Police would address the issue, describing signed, blank search warrants as documents of convenience. Connell said he has raised the issue before, but has never seen it get to the point were it was so âblatant and obviousâ that the warrant could have been created. In addition, he said the law needs to be revisited when it comes to the issuing of the search warrants, as they should not be used as tools to harass citizens and invade their privacy, without justification. SEARCHLIGHT was unable to get a comment from John, who left the court immediately after. Last Thursday, another undated document surfaced in court when the Financial Intelligence Unit (FIU) brought a case against Bequia man Brian Williams. Corporal Simon presented a search warrant in respect to cocaine and cannabis, but told the court it was in respect to counterfeit money; the warrant also had no date. During court proceedings, Williamsâ lawyer Israel Bruce argued that Simon acted with an illegitimate document. âThe police are breaking the law,â Bruce asserted. The lawyer went on to state that the warrant Simon was armed with could not guide the court as to which day it was signed. However, Browne-Matthias stated that while Bruce was right, there are provisions in the Firearm and Drug and Misuse acts that allow police officers to search without a warrant.